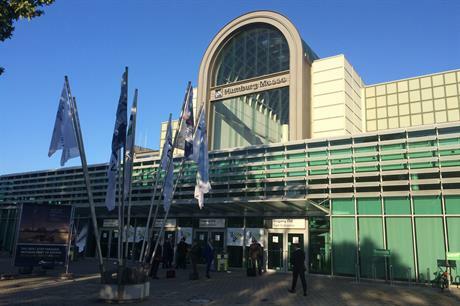 GERMANY: The global wind industry is in Hamburg this week for the WindEnergy exhibition and WindEurope conference. 19.00 German manufacturer Senvion has won a contract to supply turbines to the 203MW Trianel Borkum II project in the North Sea. 16.24 Siemens has presented a thermal storage system for wind power that it expects to begin testing in spring 2017. Excess wind energy is converted to heat in rock fill, stored and protected with an insulated cover. A steam turbine then converts the heat back to electricity when required. 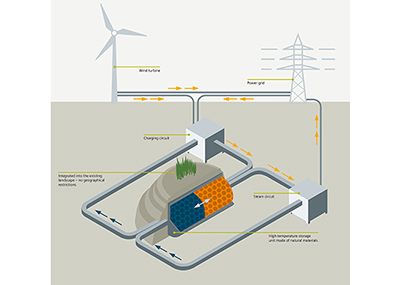 A full-size demonstrator of the FES (Future Energy Solution) will store around 36MWh of energy in a container with around 2,000 cubic metres of rock. Chinese manufacturer Envision Energy has the biggest stand at the show. 14.48: Siemens has unveiled a new generation of its its aerodynamic blade add-on, the DinoTail. Inspired by the trailing edge of an owl’s wing, the device reduces operational noise. The new generation design features vortex generators on the blade surfact, and a combination of serrations and combs on the trailing edge. 14.25: Some facts and figures from the organisers of WindEnergy Hamburg 2016 and WindEurope Summit. This year's event has attracted 1,436 exhibitors from 34 countries. They are filling nine exhibition halls with a total floor space of 65,000 square metres. More than 300 speakers will feature in the conference programme throughout the week. 13.57: Germany’s federal economy minister Sigmar Gabriel has expressed concerns over the slow rate of progress in repowering across the country. Gabriel said that repowering would help to reduce public oppostion to onshore wind as new turbines are quieter and could be built further from housing . There needs to be more discussion between government and the wind industry over how to counter growing opposition to onshore wind, he said. Luca Bettonte, CEO of Italian energy utility ERG, also wants to see more repowering, arguing that new project permitting costs in Italy are too high for wind power to compete with other energy sources. Repowering on Italy’s best sites would increase energy production by 30-40% with only one-third of the number of turbines, said Bettonte. 13.45: Europe's wind power technology leadership is at risk without a strong domestic market, said Michael Liebreich of Bloomberg New Energy Finance (BNEF) at the WindEurope Summit panel session, Business meets Policy: what future for wind in Europe? The industry must continue to lower costs and, in Europe especially, ensure that the rate of new installations does not fall further, he said. MEP Claude Turmes weighed into the big energy companies and the European Commission for their failure to deliver renewables on the scale required to combat climate change. The NIMBY (not in my back yard) problem at an individual citizen level is not as bad as the NIMC (not in my country) problem, he said, as exemplified by Spain’s big three power companies, Enel in Italy, EDF in France, and the coal industry in Poland. The report says that only seven of the EU's 28 member states have plans in place for energy and climate policies after 2020. 11.58: GE Renewable Energy has won a contract to supply turbines to the 50MW Tire project in Izmir, western Turkey. Nine 3.2MW and 13 1.7MW turbines will be installed at the Turkerler Holding project. 11.55: Policy making is failing to keep pace with wind power's advances, argued Enel Green Power CEO Francesco Venturini during a panel session at the opening of WindEurope Summit. "We need to align the speed of policy making with the speed of the industry," he said. Martin Neuber, Dong Energy's chief strategy officer, provided the numbers, pointing out that offshore wind costs have fallen 50% in three years. "It is just the beginning," he said. 10.25: SKF is launching new "spherical roller bearings" for turbine shafts, the company has announced. The 'self-aligning' bearings are expected to meet 25-year service life, according to SFK. "Features not needed in this sector, such as the ability to handle speeds up to 600 r/min, have been eliminated to focus on those that are, including improved radial and axial robustness," the firm said. 10.05 - German manufacturer Senvion has unveiled a new 3.6MW turbine for medium wind sites. The firm said the 3.6MW turbine with a 140-metre rotor compared to its 3.2MW turbine with a 122-metre rotor, yield would increase 20% in wind speeds of 7.5m/s. "The Senvion 3.6M140... utilises the innovative Eco Blade Control technology. The intelligent load management technology enables an optimized load during operation in even more challenging wind regimes," said Senvion CEO Jurgen Geissinger. Senvion said the blades were made using its recently acquired RodPack technology to allow lighter blade design. "By extending our product portfolio with this new variant, Senvion is taking another step towards tailor-made solutions for our customers. The upgrade to medium wind speed sites will open additional sites where our customer can apply this top of the line technology product. The 140 meter rotor diameter and the upgrade to 3.6 megawatts will allow additional output at the same site," he added. 09.45: Speaking at the opening session of the WindEurope summit in Hamburg, the European Commission's vice president for Energy Union, Maros Sefcovic, told delegates "We [in Europe] have been pioneers in renewable energy". Sefcovic said the new EU legislation to be brought in following the climate agreement in Paris last year would encourange national plans. Member states would "have homework" to do, he said, adding "there is no way back" from the COP21 agreement. 08.39: Some news already, this morning; MHI Vestas is named as the preferred supplier for the 252MW Deutsche Bucht offshore wind project in the German North Sea. Approximately 30 V164 turbines are set to be installed at the site. 08:30: Over the next week, Windpower Monthly will bring you the latest news and interviews online, and on Windpower Monthly TV in association with Sentient Science. Stay tuned for the opening session of the conference, where the European Commission vice-president of the energy union Maros Sefcovic will be addressing delegates.